Inside the Computer History Museum is one of the most incredible inventions ever conceived, Babbage's Difference Engine. The 1849 device adds, subtracts, multiplies and divides mechanically by turning a crank handle. Eleven feet in length, five tons in weight, and constructed from 8,000 parts, the mechanical device is accurate to 31 digits. 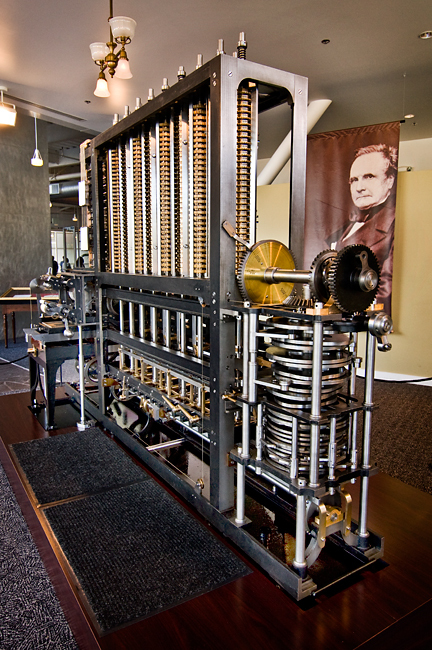 Charles Babbage designed the device to eliminate human error from calculations but did not live to see the construction of this version which became, in essence, the world's first computer. Babbage's Engine is just one of the many facsinating inventions you'll find in Mountain View's Computer History Museum. The collection also includes IBM's Deep Blue, the chess-playing computer that defeated Garry Kasparov as well as the first Macintosh computer. The museum's Visible Storage exhibit is one of the world's largest collections of computing artifacts and contains thousands of computing devices from tiny abacuses to room-sized Cray supercomputers, from Minuteman Missile guidance systems to console video games. The museum is located in the heart of Silicon Valley and free to the public.